Going GREEN doesn’t have to just mean being environmentally conscientiousness. It can also mean getting a little more green in your wallet when staging your home to sell. HomeGain.com, a leading site on all things real estate related, conducted a survey and found the top nine DIY home improvements. 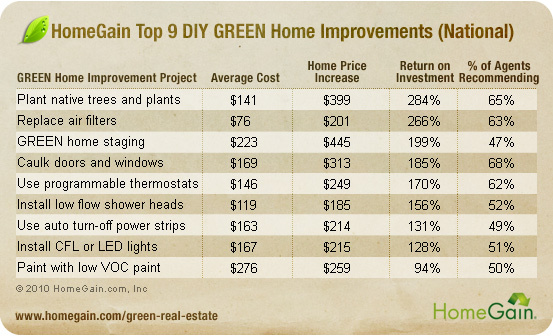 Remember too that many of these green tips not only create a return on investment when preparing your home for sale, but also while you are living in it. Things like caulking doors & windows, installing low flow shower heads, turning off power strips and using CFL or LED lights can also save big money on your utility bills. This is exactly why I chose to be an EcoStager in Central Florida. Not only am I providing my clients with solid selling advice, my clients receive information that can assist them in their new home. They are armed with information on saving water, electric & keeping toxins to a minimum ( and so much more). Thank you for sharing the benefits. As I was writing this, I was thinking about you. I think there should be more GREEN stagers, or at the very least we should be better versed on what to do and how to recommend it to our clients.